It took sharp and patient eyes, but researcher Mark Showalter of the SETI Institute has found a tiny moon orbiting Neptune that’s never been seen before. Showalter used archival data from the Hubble Space Telescope to find the moon, designated S/2004 N 1, which is estimated to be no more than 19 km (12 miles) across, making it the smallest known moon in the Neptunian system. 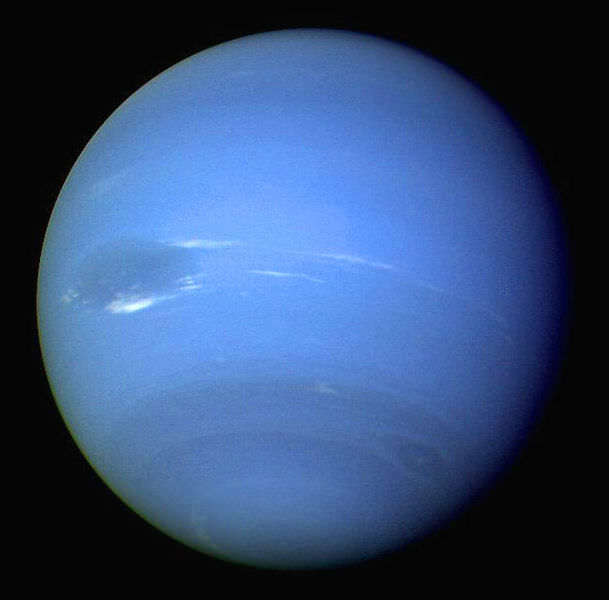 This is the 14th known moon of Neptune. S/2004 N 1 is so small and dim that it is roughly 100 million times fainter than the faintest star that can be seen with the naked eye, NASA said. Even Voyager 2 –which flew past Neptune in 1989 to survey planet’s system of moons and rings – didn’t catch a view of this moon, even though data from Voyager 2 revealed several other moons. Showalter was studying the faint arcs, or segments of rings, around Neptune earlier this month. The method involved tracking the movement of a white dot that appears over and over again in more than 150 archival Neptune photographs taken by Hubble from 2004 to 2009. Showalter noticed the white dot about 100,000 km (65,400 miles) from Neptune, located between the orbits of the Neptunian moons Larissa and Proteus. Showalter plotted a circular orbit for the moon, which completes one revolution around Neptune every 23 hours. Showalter should get the “Eagle Eyes” award for 2013! Yeah, I know that miles are bigger than kms, but 1,000,000km does not equal 65,400 miles. I think there’s a missing 0. With an orbital period of only 23 hours, I think the miles are correct and the km should be ~100,000. Doesn’t “100,000,000 times fainter” make it 36th magnitude? They really need to reevaluate Pluto not being a planted if they’re willing to call a 12mile spec a moon.